Christopher R. Bell is the founder, owner and President of Keystone Answering Service. Mr. Bell strives to bring innovation and productivity improvements into his company to remain competitive, and on the leading edge of continuously evolving technology. 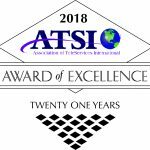 He’s proud of the fact that his company and staff have been nominated for the prestigious ATSI Award of Excellence twenty-one consecutive years. Only four telephone answering services in the United States have a record that can match that level of performance. Keystone holds ATSI 24/7 Gold Site Certification certificate # 001. The Keystone and Business Connect offices are also ATSI 24/7 Gold Site Certified. Chris has assembled a strong management team along with a team of highly qualified agents during his career in the telephone answering service industry. In 2015, he completed a year-long project to relocate the call center from Levittown, Pennsylvania to newly-renovated space in Newtown, Pennsylvania. Mr. Bell holds a B.S. in Forest Products from The Pennsylvania State University, and an MBA in Finance from Drexel University. He is an Eagle Scout and is married. They have two sons who are recent college graduates and who are also Eagle Scouts. He has served in the BSA scouting program for eleven years. He has taught Finance at Drexel and Business Management at Bucks County Community College. He enjoys hiking, golf, fishing, and bicycling with his family. Mr. Bell is dedicated to not only providing excellent service to Keystone clients, but also to ensuring that the Telephone Answering Service (TAS) industry continually improves best practices to ensure quality services to clients of all TAS providers. He is currently working with the ATSI Certification Committee to update the Site Re-Certification program and identify “best practices,” while seeking out industry leading “next practices.” In 2015 Chris completed two consecutive terms on the boards of the Atlantic States Telephone Answering Association (ASTAA). He also served two terms on the Association of TeleServices International (ATSI). He also serves on the SNUG Certification Committee. In 2014, he created a Financial Benchmark Toolkit for ATSI members. Mr. Bell was President of the Startel National Users Group (SNUG) in 2001. During his tenure, the 2001 SNUG Board developed and released into the telephone answering service (TAS) industry Agent, Supervisor, and Site Certification programs. Mr. Bell was asked by SNUG in 2002 to serve as the SNUG Representative on the ATSI Board. In that capacity he helped develop and shepherd in the agreement which brought the Certification programs into ATSI and into the Telephone Answering Service industry. Mr. Bell was elected in 2006 to the Board of Directors for the Association of TeleServices International (ATSI) and served for two years, from July 2006 until June of 2008. He helped secure rate discounts with the industry’s insurance carrier for multi-year ATSI Award of Excellence recipients. In 2008, he collaborated on the development of Dispatcher Certification for the industry. He has published several papers and articles on industry Certification programs and platform and system conversions in the industry trade journal Connections Magazine, and in the SNUG Galaxy Newsletter. From 2004 to 2008, Mr. Bell served on the WSTA Board. In 2007, he sponsored several Disaster Recovery Webinars through ATSI and SNUG in an effort to help introduce the Agility Recovery Solutions facility restoration program to the TAS industry. In addition, he has presented on Disaster Recovery and employee profiling programs at WSTA, SNUG, and ATSI Conferences. In 2004, Mr. Bell was awarded the prestigious SNUG Don Berry Award of Excellence for outstanding service as a Startel User in the TAS Industry.